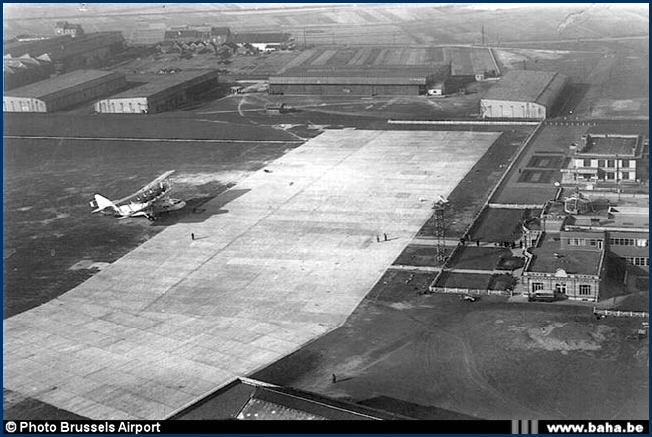 In the early thirties the first concrete apron was laid to park visiting aircraft. Before that the machines sank halfway their wheels in mud. Curiously the Short Scylla stopped precisely at the edge of the new concrete apron. The argument that the air terminals (to the right) are not to be preserved (anno 2005) because they are not in an airport environment is not funded. Even some of the hangars seen in the background still exist today. As we do want to keep this preservation file feasible cost wise, we don't ask for the hangars to be preserved, only both terminals. 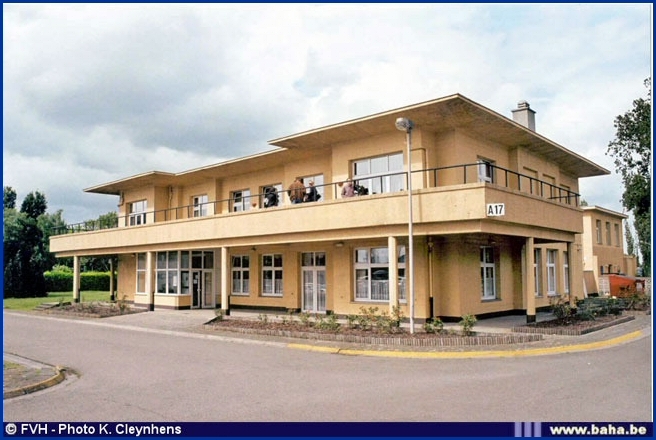 It feels good to know that finally a very active movement is getting in motion to try to safe from demolition the old and very important airfield buildings at Haren. Readers have rightfully pointed out that even in aeronautical circles very few people realise why these buildings are in urgent need of official protection. 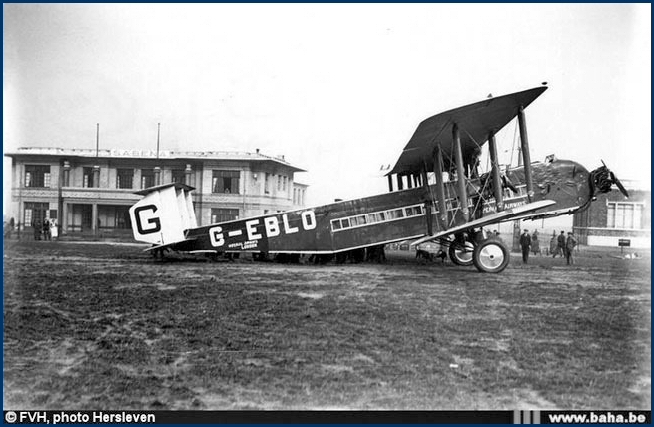 Early in 1919, new born civil aviation slowly started operations from the Haren/Evere airfield. 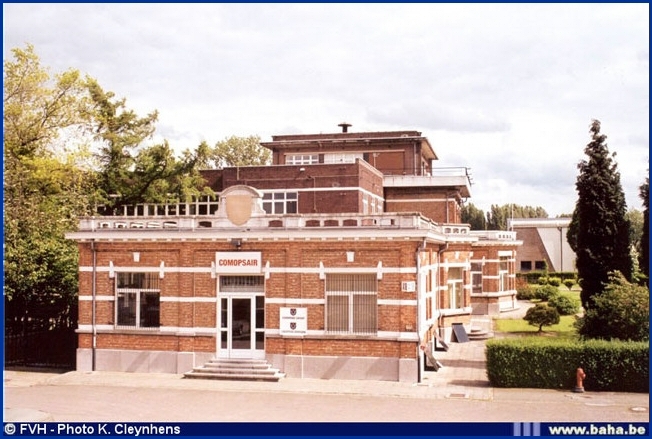 Originally companies such as SNETA (Syndicat National pour l’Etude des Transport Aériens) settled in the military barracks at Evere, near the Haachtsesteenweg. This was done for practical reasons as the first fragile civil aircraft needed logistical and technical support only available through the Militaire Luchtvaart/Aviation Militaire. Our very fist civil aviation buildings have not survived the test of time. A stone building and a wooden shed used for welcoming Sabena passengers was in service up to 1924. A wooden hangar made available by the military to the civil aviation unfortunately was destroyed by fire on 27 September 1921. At least seven SNETA aircraft were destroyed and the timetable of our early airline completely ruined. Imperial Airways Armstrong Whitworth Argosy (note the open cockpit) in front of the terminal decorated with beautiful African inspired frontages. The name Sabena is painted on the roof side. 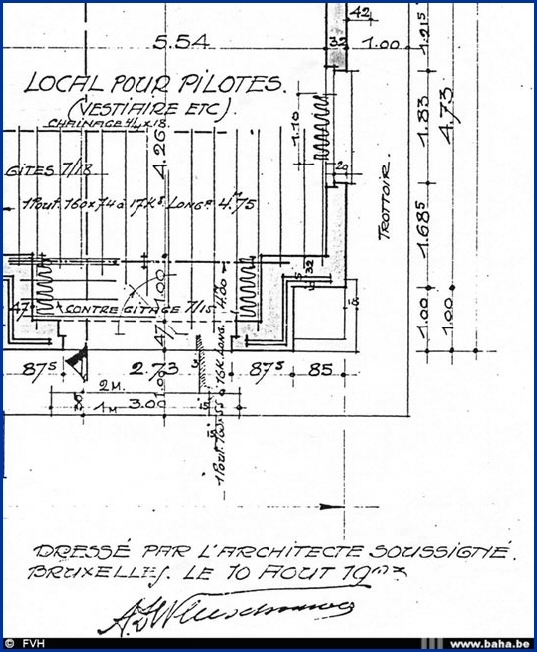 In October 1923 Sabena (created that same year) requested a building permit from the city of Brussels to erect a dedicated new airport building at the Northern side of the airfield. The land was entirely situated on the commune of Haren not far away from todays building housing the "Bestuur der Luchtvaart" and Eurocontrol. The “Batiment Direction-Exploitation Sabena” was in use from 1924 onward. 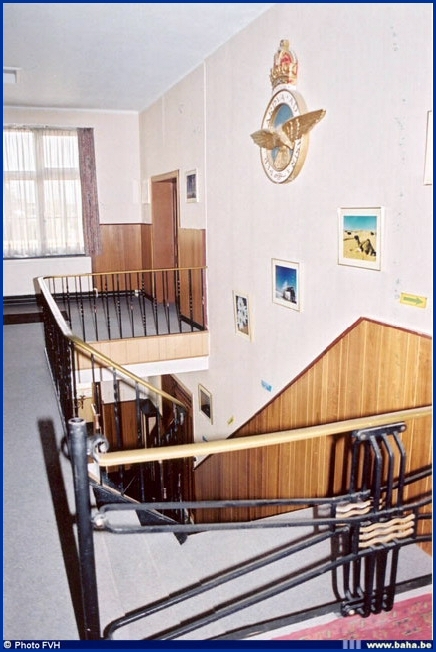 For the first time several airport services were centralized in one building: Sabena, representatives of other airlines, a cargo division, the airfield commander, etc. It was not exceptional that Sabena was directly involved, later the company would also survey the construction of the "Expo-terminal building" at Zaventem. Very cosy atmosphere on the Avia-Palace's terraces. The height of the fence is a clear indication that airport safety was of a somewhat different nature than what we're used to nowadays. The Avia-Palace building in 2003. At the back of the building is the housekeepers’ home. 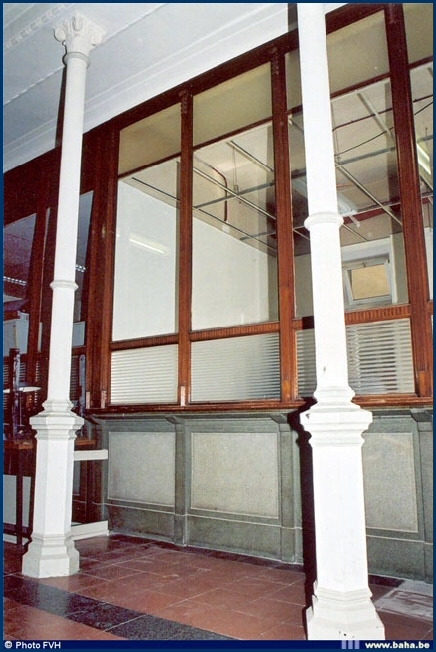 This picture clearly shows that Comopsair has maintained the building in excellent condition. Only a couple of years ago, it was envisaged to repaint the African frontages on the walls of this former-terminal. 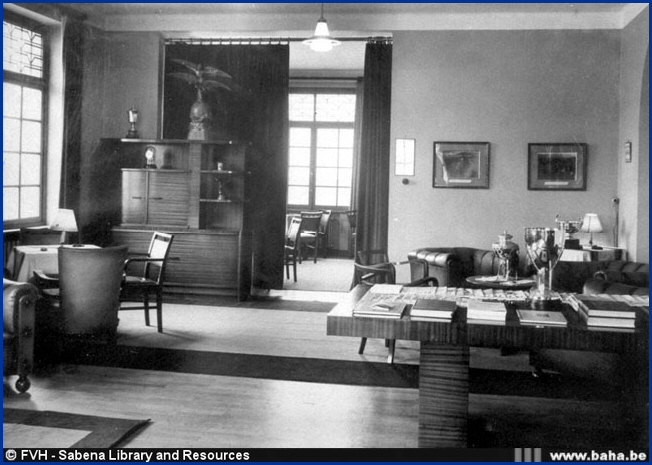 The very stylish room of "Le Club d’Aviateurs de Bruxelles" on the first floor of the pre-war Avia-Palace. 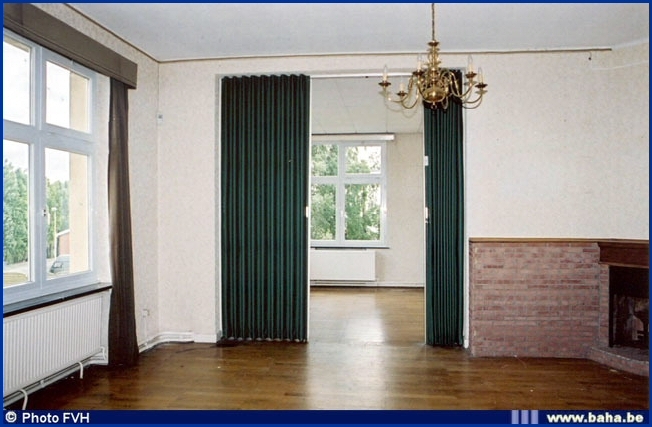 The same room in July 2001. To the right a fire-place was installed. Memorial plate at the entrance of the Avia-Palace (2001.) Here, aeronautical history is kept alive. 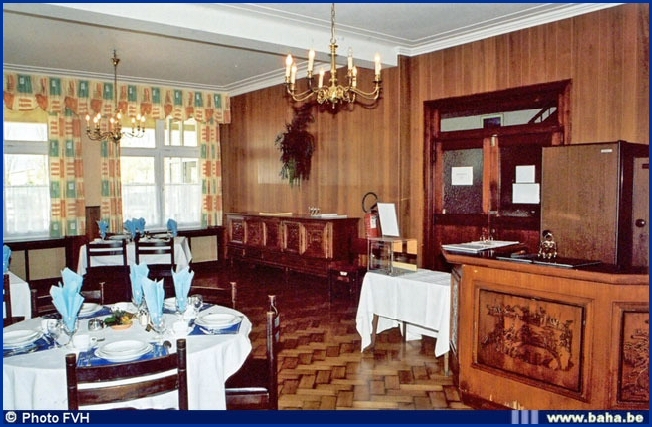 The restaurant of the Avia-Palace at the end of the thirties. 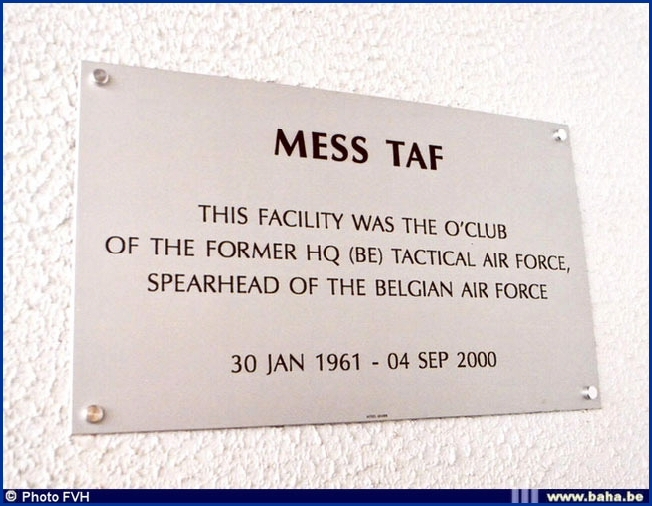 The same spot in July 2001 when it was an officers' Mess. 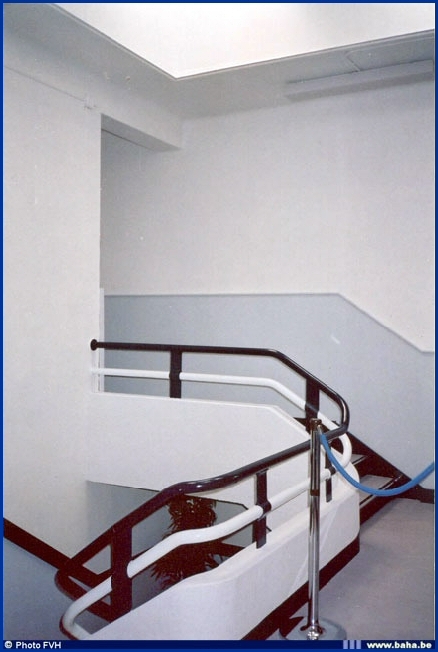 The architect of the 1924 terminal decided to take the Le Bourget buildings as an example. The Paris airport opened an "aérogare" two years earlier and resemblance with the Haren building is striking. Slightly more chauvinist France of course preserved its first "aérogare” which stands next to the 1937 terminal now housing the "Musée de l'Air et de l'Espace". Haren at about 1928. To the right of the non finished terminal are the TSF-antennas (Téléphonie Sans Fil or wireless). On top of the building constructed out of "Boomse" bricks is a "glazed lighthouse". The press of the day talked about "de nieuwe vliegstatie van Haren” or "the new air-station of Haren", again a clear reference to the railways. Frontal view of the "aérogare" of 1929 taken in May 2002. The central part was later raised and at the back the building was extended. 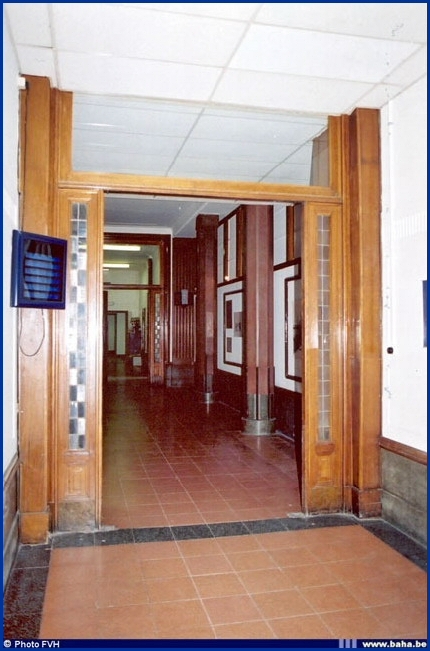 Side-view taken in 2002, with an entrance for the Staff of Comopsair. 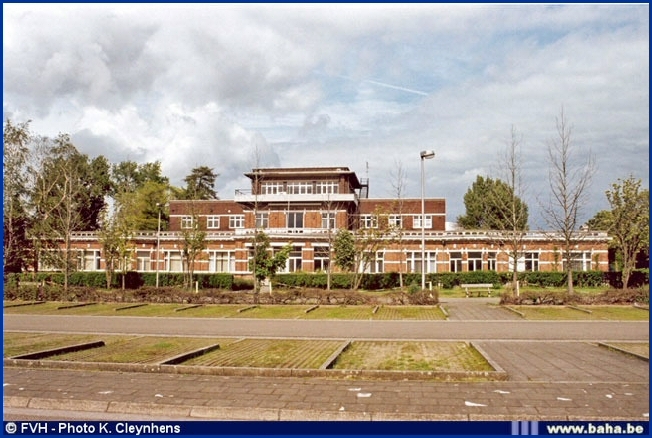 This building was used from 1929 onwards, the same year that the first stone was laid for the Terminal at Deurne airport. 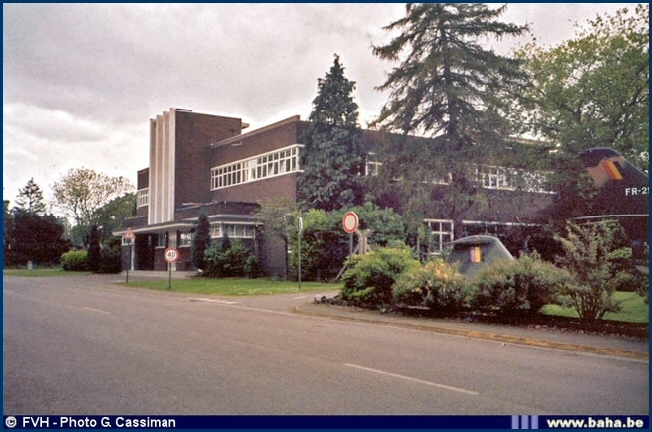 At the time of its opening the Sabena-building, no less than 50 passengers a day were using the Haren grass airfield and aircraft occupation was still below 20%. 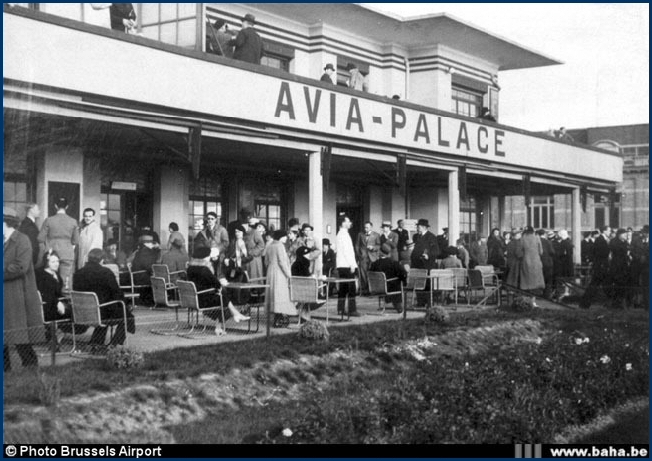 A top airfield such as Berlin in 1928 reached some 113 arriving and departing passengers a day. 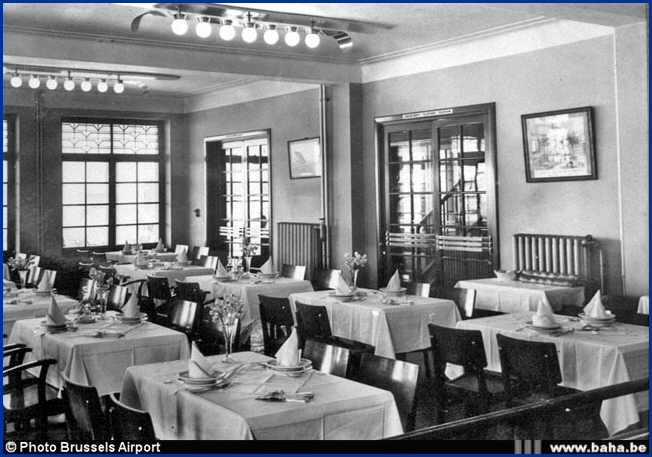 But aviation evolved very fast and from their cane seats the visitors of the Haren "aérogare” could see the departure of the first flight to Belgian Congo (12 February 1925) or the visit of celebrities such as Charles Lindbergh (28-29 May 1927). Is this splendid art-deco hall to be demolished? 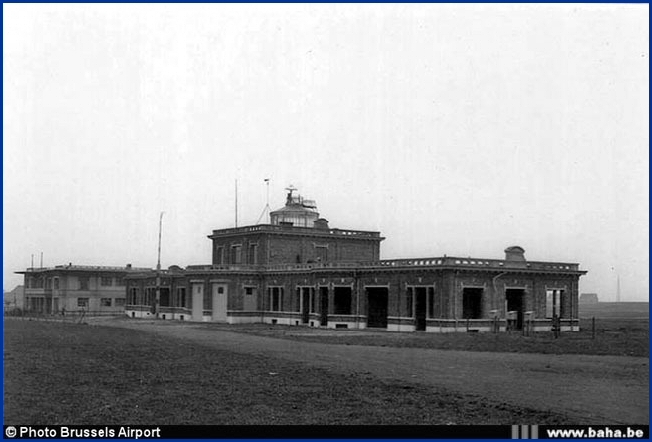 On 29 September 1929 a new terminal was opened next to the 1924 building. In 2005 experts are in dispute over the architectural importance of the building and it is correct that it resembles a railway station but there lies as a matter of fact the origin of the term "aérogare". As from 1 September 1925, Defence was no longer responsible for the civil aviation, which was now in the hands of the Ministry of Transport. The designers of our railway stations clearly influenced the builders of the red brick terminal. A navigation light, precursor of today's control towers, was positioned on top of the building. All services were centralised within the "aérogare" and passengers were even able to purchase a ticket on the spot, something which before was only possible in downtown Brussels. The 1929 passengers ticketing desks.